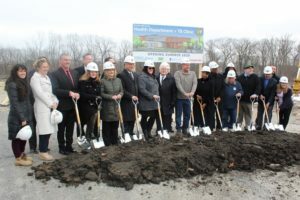 The Will County Health Department held their Groundbreaking Ceremony for the new Will County Health Department Building Tuesday afternoon February 5th. The new facility, being built on the same campus along Neal Avenue just south of I-80 and Richards, is scheduled for completion in mid-2020. Preparation work for the new building began in late 2018. The new facility will house the WCHD’s Environmental Health, Family Health Services (which includes WIC), Behavioral Health, and Administrative Divisions. The WCHD’s Community Health Center will continue to be just south of the WCHD facility.